Beaney, J & Littlejohn, J 1998, Stitch Magic, BT Batsford Ltd, London. Borrowed from the library. This book largely concentrates on hand stitching, with one chapter that also discusses combining hand with machine stitching. 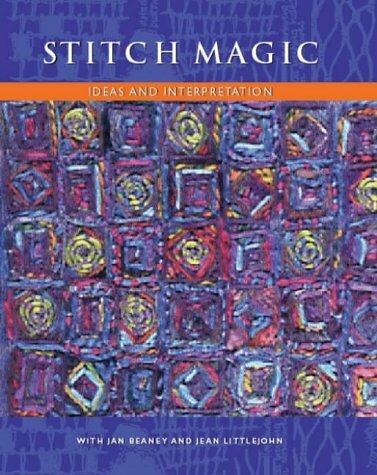 It is not a project book, or a prescriptive recipe for stitch, but rather a book of suggestions for how different stitches can be varied to add interest and produce different effects. It is packed with colour photographs of textile pieces, one of the good points of this book is that the photos are close ups of work and show enough detail so the reader can see the stitches clearly. In a lot of the examples the stitches are very densely packed or layered on top of each other; in other examples where the stitches are more spaced out they are cleverly blended with the background through use of colour, with the backgrounds being painted and toning threads used so sometimes it is hard to tell which is background and what is stitch. There are two sections that I particularly found of interest. One is the analogy of Mountains and Foothills for layering stitches “high peaks and ridges give way to lower ones before the foothills take over and merge into the undulating plains at the base of the mountain”. The other is the guidance given for tracking the different shades through an image that is to be created in stitch, by following the lines of each shade down the image with a finger to see how and where each shade links up and unifies the piece. ← Sketchbook hits and misses….